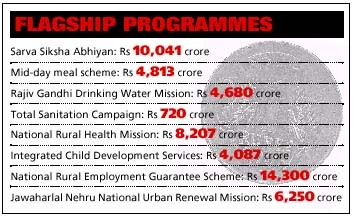 finance Minister P Chidambaram's budget gave eight flagship programmes 43 per cent more allocation (at Rs 50,015 crore) in the 2006-07 Union budget. Chidambaram took note of the National Commission for Farmers report and reduced the interest rate on short-term credit to farmers to seven per cent for an upper-limit loan of Rs 3,00,000, from the prevailing rate of 9.5 to 10 per cent. The farm credit target has been increased to Rs 1,75,000 crore to bring an additional five million farmers into the institutional credit net. Given that four states and a Union territory are going to the polls this year, it's clear that the government has learnt its lesson the hard way. This increased spending isn't going to do much to address the need to rein in the fiscal deficit. But what is going to help is the refusal to make allocations for addressing environmental concerns. Sample this. India's hospital waste management got Rs 1 crore, while government residential buildings got Rs 665 crore -- almost Rs 200 crore more than last year's allocations. Programmes for environment impact assessments got Rs 2.55 crore, and development and promotion of cleaner technologies Rs 1.5 crore. Peanuts? There were no surprises at all on the waterfront as well. Chidambaram announced a Rs 4,481-crore scheme to revive 20,000 water bodies, though its predecessor -- the Rs 300-crore National Programme for Repair, Restoration and Renovation of Waterbodies linked to Agriculture -- remains a non-starter. Groundwater quality monitoring and research and implementation of artificial recharge do not figure in his scheme of things. Which means, the National Scheme for Artificial Recharge of Groundwater announced in 2004-05 will not take off. Environmental problems in urban areas due to lack of a functional network of sewerage lines and treatment systems, are here to stay. So are the water problems. Merging the urban water supply and sanitation system under the Jawaharlal Nehru Urban Renewal Mission has finally undermined the importance of urban water supply and sewerage. The allocation in this sector has been scaled down to Rs 50 crore, nearly half of last year's allotment. Though allocations for water supply for urban poor have not been spelt out, the low-cost sanitation gets Rs 30 crore -- the same as last year's allocation (of which only Rs 5 crore was spent). The only saving grace, perhaps, was the proposal to institutionalise community-based water quality monitoring in rural areas. Chidambaram reduced the excise duty on aerated drinks and small cars (length not exceeding 4 metres and with an engine capacity not exceeding 1,500 cc for diesel cars and 1,200 cc for petrol cars). The idea is to make India a hub for the manufacture of small and fuel-efficient cars. The government will reportedly be losing around Rs 700 to 800 crore on this excise concession. An alternative approach, one that would not have led to significant revenue losses, would be increasing taxes on vehicles that are fuel-inefficient and which use fuels that are demonstratedly more polluting sports utility vehicles, which guzzle diesel, the most polluting fuel, could have been a target. This would have been a more rational approach to achieving what Chidambaram apparently wanted: increasing the sales of smaller, more fuel-efficient cars. Again, by reducing the excise on soft drinks, in one sweep the government has undone all the work that voluntary organisations, the judiciary and the political class accomplished with respect to restraining the consumption of these beverages. Public health issues clearly have not been factored in. 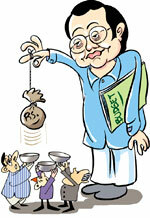 So what is budget 2006 all about? Status quo. Riding a high-growth trajectory, sops have been made available to the biggest constituency -- agriculture -- in a major election year. Environmental audits are obviously not the flavour of this month.